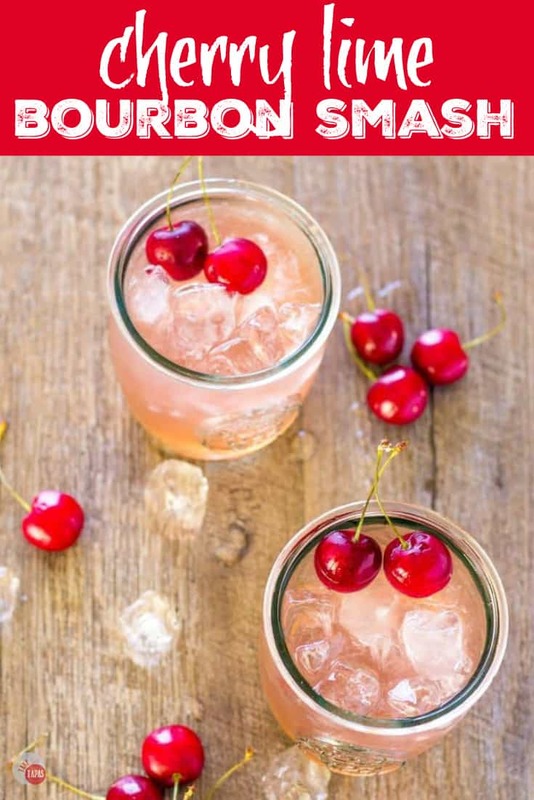 Enjoy the rich caramel notes of bourbon mingling with sweet cherries and lime in my latest 3-ingredient cocktail the Cherry Lime Bourbon Smash! Deep and robust, bourbon isn’t just for nighttime anymore. My Cherry Bourbon Lime Smash Cocktail is perfect for daytime too! Now sticking with the 3-Ingredient Cocktail Series, I am bringing you cocktail number 5 but if you count my tips on the Perfect Sangria (and recipe) it is number 6. The Summer Apple Sangria only contains 3 ingredients too so I will throw that in there too. If you haven’t checked out my 3-Ingredient Orange Jubilee, Margarita, Limoncello Lady, and my Simple Sangria, I will wait here sipping my bourbon while you catch up. Just take me to the Cherry Lime Bourbon Smash Recipe Already! If you’d rather skip my (very helpful, I think) tips and tricks, essential cooking info, and similar recipe ideas – and get straight to this delicious easy Cherry Lime Bourbon Smash recipe – simply scroll to the bottom of the page where you can find the printable recipe card. You guys know by now that my hubby is a huge bourbon fan. He has over 78 bottles now! I can’t complain, I just bought him one today because he likes Woodford and he didn’t have this bottle of Double Barrel yet. 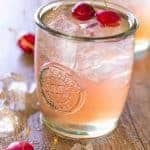 When I made my Roasted Cranberry Bourbon Crush this past November, I told you about how a bartender in Kentucky got me to appreciate drinking bourbon with my husband by introducing me to Raspberry Gingerale and Bourbon. The combination is of bourbon and cherry juice is amazing and the fruit tones down the burn of the bourbon. I am following this tradition (only in my house is this tradition) and trying Brooks’ bourbon (his good stuff) with cherries. Sweet, dark, rich, with a little tartness. Cherries are the bomb! We just nabbed 10 pounds of fresh cherries at the farmer’s market for $6.50! That is a lot of cherries!! I am loving every one of them. Until I pit about 4 pounds and then I am over it. I did this a few years ago when the cherries are in season. It looked like a massacre in my kitchen and I ruined a pretty shirt with red dots. But I had bags of pitted, sliced cherries in my freezer for all sorts of dishes! I use these convenient bags of frozen cherries for smoothies, frozen margaritas, mixing with my chia pudding, and also keeping my drinks cold without diluting it. For my Cherry Lime Bourbon Smash, I use fresh cherries and a soda. And a little bit of lime to round it out. The lime in this cocktail is important! Bourbon itself is sweet and so are the cherries so mixing the bourbon and lime balances out those sweeter flavors. 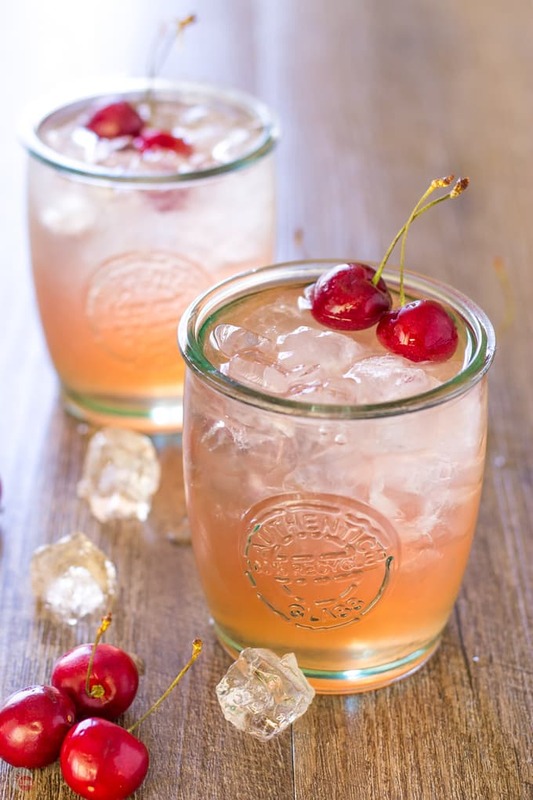 A bourbon lime cocktail mixes with sweet and tart cherries is the epitome of balance! Q: Can I use frozen cherries? A: Of course you can! Cherries are not always in season so feel free to use frozen if you need to! 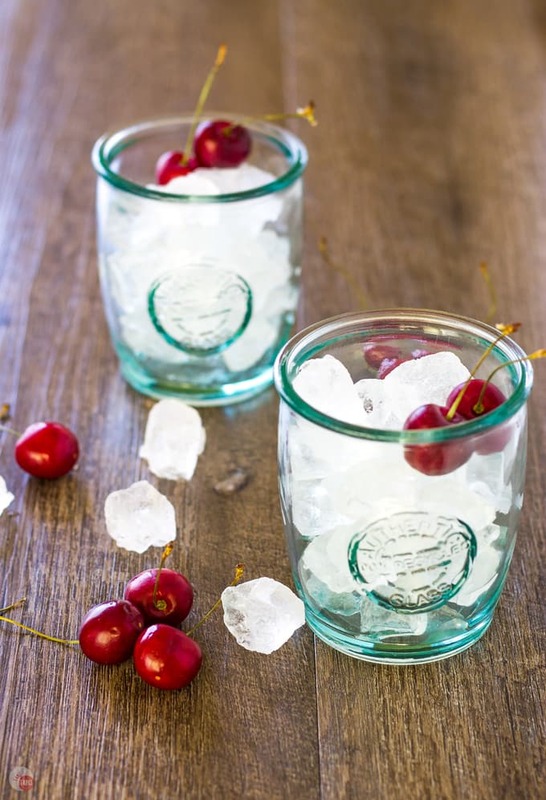 Q: Can I still make the cherry soda if I use frozen cherries? A: Yes you can. You can also buy cherry soda such as Cheerwine if you need to. Just be wary that a sugary soda will change the flavor profile a bit. Q: Can I make this into a frozen cocktail for a hot day? A: Feel free to add the ingredients to a blender along with some ice! Q: How long will the fresh cherry soda last if I make a big batch? A: The fresh cherry soda will really only last about 24 hours after you make it. If you need to make the cocktail ahead of time you are better off using a commercial soda but you will still lose carbonation unless you have a way to seal it up tight. Muddled Cherries and soda, bourbon, and lime juice. Or a cherry soda, bourbon, and lime juice. Either way, it’s 3 ingredients! Don’t come down on soda as it helps keep my cocktails simple. Not extra citrus to juice, no simple syrup to make, no soda water or seltzer to get your bubbles. It’s all included. For this cocktail, I muddled some cherries and added it to the soda. If you don’t want to do that, just use a cherry soda. Simple as that. And I won’t judge you. Other great Cherry Cocktail recipes to try! 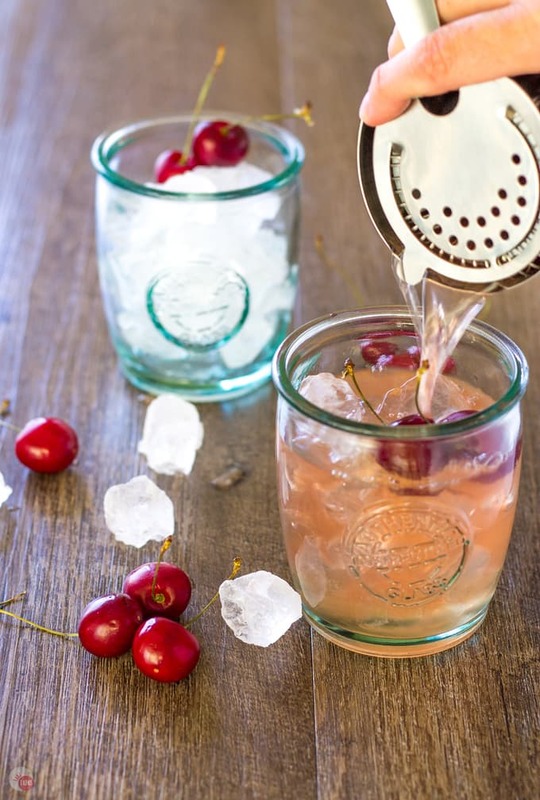 If you are lacking a cocktail shaker, muddler, or measuring cups to make a Cherry Lime Bourbon Smash check out this one that I like and don’t forget your cherry pitter! I have an old-fashioned one, not one with a fancy handle and plastic pieces. The sturdy metal ones work the best. This cocktail reminds me of the Apple Old Fashioned my Friend Meghan from Fox and Briar makes. It has muddled orange and cocktail cherries! Looking for a great 3 Ingredient Cocktail? 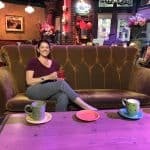 Check out all my easy cocktail recipes! If you love this Cherry Lime Bourbon Smash Recipe as much as I do, please write a five-star review in the comment section below (or on Pinterest with the “tried it” button – you can now add pictures into reviews, too! ), and be sure to help me share on facebook! Want something refreshing? Drink up buttercup! My Cherry Lime Bourbon Smash is ready for you! Combine the bourbon, cherry soda, and lime juice in a container. Add ice to 2 glasses. Pour the cocktail over the ice, splitting between the two glasses. Garnish with fresh cherries or a lime wedge. 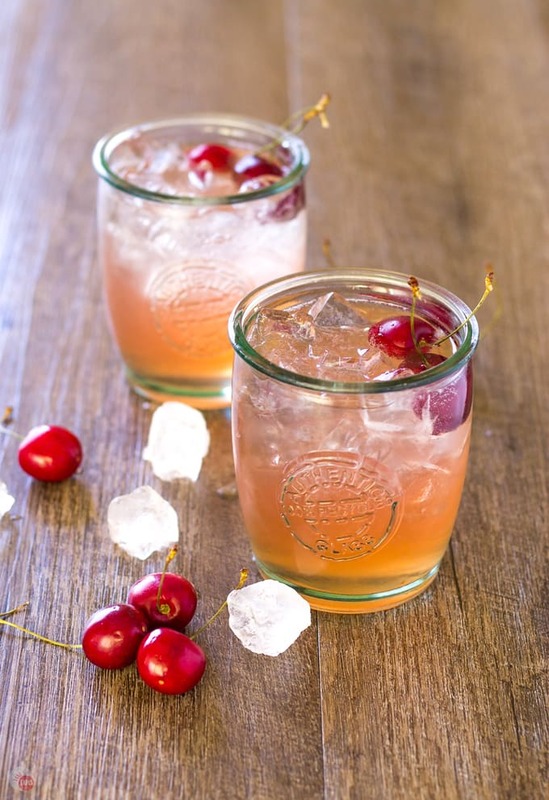 To make the cherry soda, you can muddle a 1/2 cup of fresh cherries with a cocktail muddler and add them and their juice to the 8 ounces of soda. Feel free to use a lemon-lime soda or plain soda water. I’m excited to try this drink! It sounds amazing!! I’m in love with the glasses too. Where did you find these little beauties?? I happened upon these at TJMaxx but also have another set that I found on ebay but searching “authentic recycled glass.” I love these too!! Yum! I’m going to make this as soon as possible. I just bought Blantons single barrel bourbon. Where’d you get those great glasses? Thank you so much! It is great with Blantons! I got them from ebay when I saw them on the internet. Every now and then I can find some at TJMaxx. Adding bourbon to one of my favorite drinks, Cherry Lime, makes me want to try this right away. Just wanted you to know that I shared this as part of a summer round up of treats. Thanks for linking up to Create Link Inspire party. Hope to see you soon! Yummy! Thank you for sharing it at Food Friday! Excited to see what you’ll be sharing next!